The Best Pintxos Cooking Class Ever! Food is definitely one of the reasons I wanted to visit San Sebastian in Basque Country. There are more Michelin starred restaurants per capita than anywhere else. In Basque Country, they love pintxos which are small plates similar to tapas. Pintxos get their name from the word “pincho” which means spike because they usually have a toothpick to hold them together and make them easier to grab. Russell and I planned to try as many pintxos as we could during our visit and thought it would be fun to also take a pintxos cooking class in San Sebastian to learn more about the tradition. 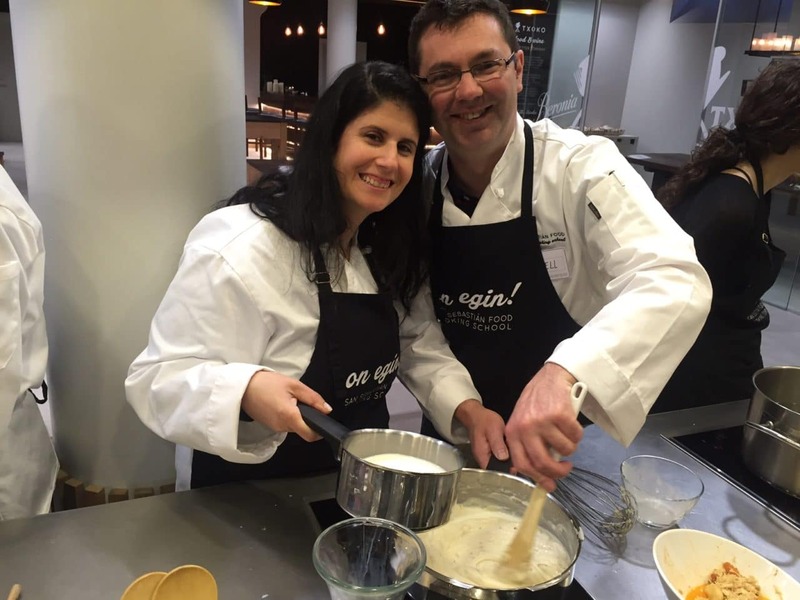 Let me tell you about our experience and how you can learn more about Basque cooking. Anisa with her favorite pintxo, Tosta de Bacalao. You may remember, I took a cooking class when I went to Chiang Mai, Thailand, and I enjoyed it. The class I took with San Sebastian Food (now called Mimo) makes that one seem amateur. We were going to be cooking in a state of the art kitchen with two professionally trained chefs to teach us. While it wasn’t a private cooking course, we would get plenty of personal attention, since there were only five of us in the class. Oh and last but not least, there would be plenty of adult beverages. We began in a classroom in the Basque cooking school with introductions and an overview of the menu. We would be making five different pintxos and then dessert. It would be like our own San Sebastian Pintxos Crawl! Time to put on our aprons and head to the kitchen. Some of the ingredients we would be using during our Pintxos Cooking Class. First, we got an overview of the ingredients, and then it was time to do the chopping. Since it was divided amongst the class, it wasn’t that much to cut up. I need to work on my knife skills but Russell, on the other hand, got complimented on his chopping skills. So going forward when Russell and I cook together, he is in charge of chopping. Once the knives were put away, we were offered drinks. They had a great selection including Basque cider, txokoli (Basque white sparkling wine), beer, and other Spanish wines. We were also served different wines paired with the food we made. It was great preparation for our day in Rioja. Russell taking a break and enjoying some wine during our Pintxos Cooking Class. 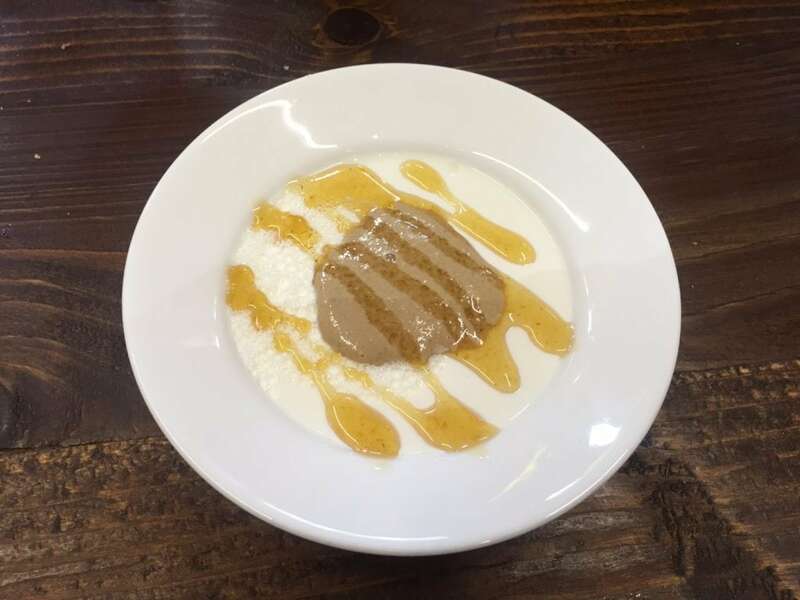 The first dish we made in our San Sebastian cooking class was Pintxo Indurain. This is a very traditional Basque recipe that you will see at most Pintxo bars. 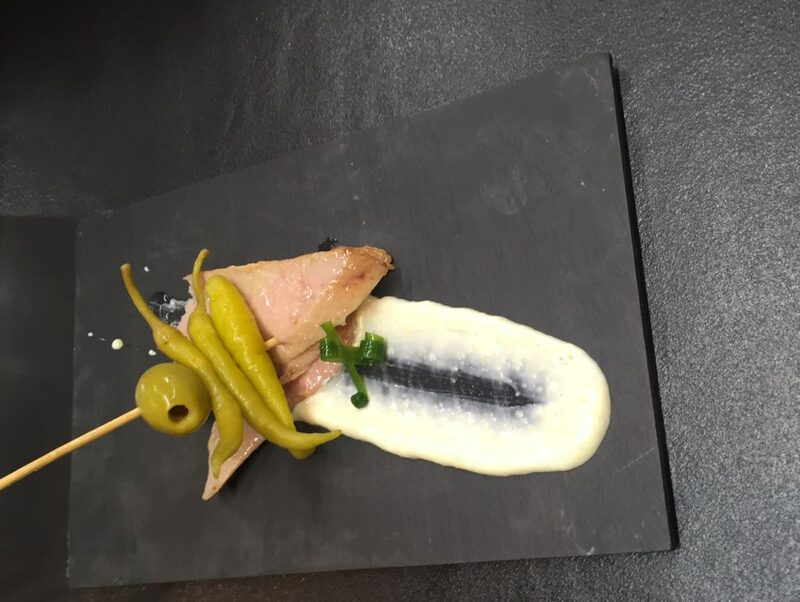 It is basically fish (in our case we used tuna) with olive and a guindilla pepper on a toothpick served with a flavored mayonnaise sauce. The guindilla pepper is traditional in Basque country, but you could substitute another type of pickled pepper and I think it would work. The presentation of this dish also makes it special. Pintxo Indurain is a very traditional dish. Next, we made fried shrimp called Gamba Gabardina. I think the ingredient that made this dish special was the saffron, which we added to the batter. 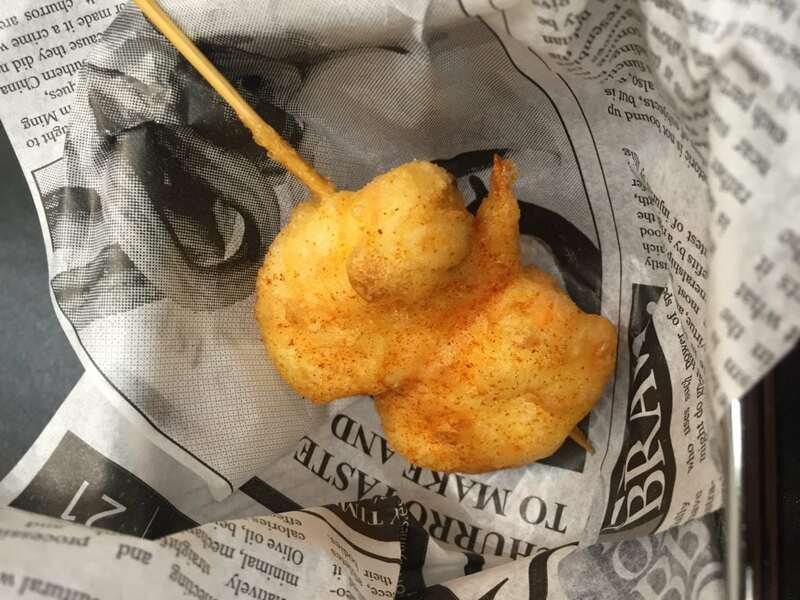 The shrimp is deep-fried but I wonder if you could get a similar result with an air fryer. The Tosta de Bacalao was my favorite dish from the class. It is cod served on a piece of bread with the fabulous Basque Pil Pil sauce. Learning how this sauce was made was fascinating! 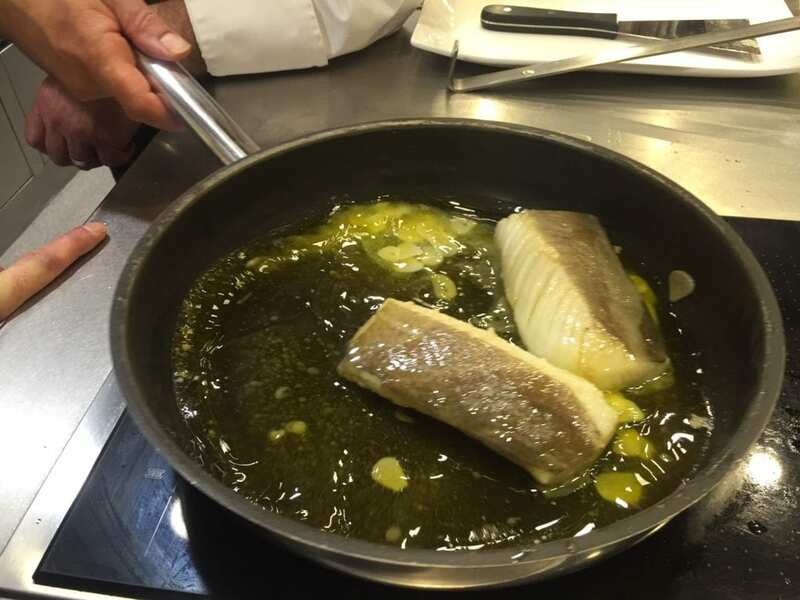 You cook the cod in a lot of olive oil and you move the pan so that the fish moves around. The gelatin that is between the skin and the meat of the fish releases into the olive oil and makes it creamy. The Basque cod just melts in your mouth and the sauce is delicious. I was excited that we were making croquetas, one of my favorite foods, during our pintxos cooking class. 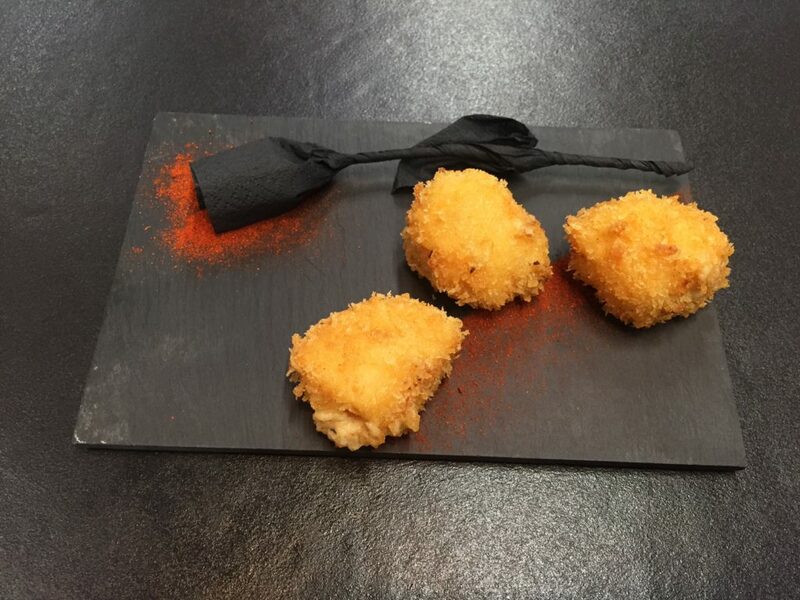 We made Croqueta de Txangurro which are crab croquetas, but the recipe could be adapted to make other types of croquetas like mushroom, ham, or fish. I also assumed that croquetas had potatoes in them, but I learned that is not the case. The inside of the croqueta is actually made of butter, flour, and milk! The process is similar to when you are making a cheese sauce. Then once the sauce is ready it needs to be chilled overnight before you fry it, but in the state-of-the-art kitchen, they had a machine that chilled it in a few hours. Our last pintxos dish was Pimientos Rellenos De Carrillera, which are special small Basque red peppers stuffed with beef that is slow cooked. We started cooking the meat early in the class so after a few hours it was very tender and easy to shred. By the time we got to dessert, I was already pretty full. We made Intxaursalsa, which was like a walnut pudding. It was different than any other dessert I have tried and while it tasted fine, it wasn’t the most visually appealing. Our dessert was sort of like a walnut pudding. The Basque cooking class was scheduled for four hours, but it ended up lasting almost six. Everyone was just having so much fun, including our instructors. It was so nice not to feel rushed. After the class, we visited their gourmet shop (also available online). They have a great selection of Basque food and wine products that are priced very fairly. I bought a bottle of Basque cider and some spices. I should also mention that our teachers at the San Sebastian culinary school were great. Not only had they planned a fabulous menu, but they wanted to make sure everyone was learning. They were very patient, answered all my questions, and were so much fun. If you would like to try doing some Basque cooking at home, you can download San Sebastian Food’s free pintxos cookbook. 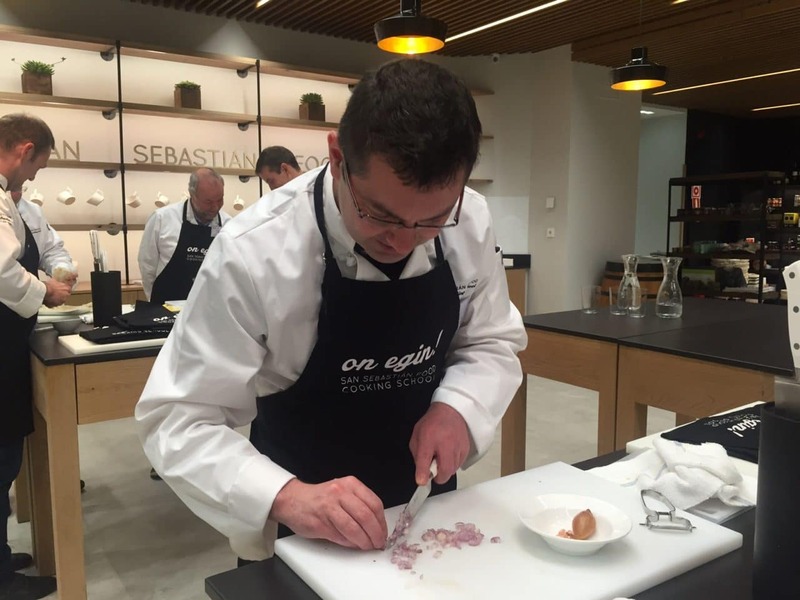 I enjoyed my time at the San Sebastian cooking school. We just had the best time and enjoyed all the Basque food we made. Have you taken a cooking class while traveling? I would love to hear about your experience. Come to the class hungry, you will have plenty of food! Check out their gourmet shop (also available online), they have a great selection and it’s reasonably priced. Don’t plan something right after the class, as it may go longer than scheduled. If you would like to try some Basque recipes at home, you can download San Sebastian Food’s free ebook. 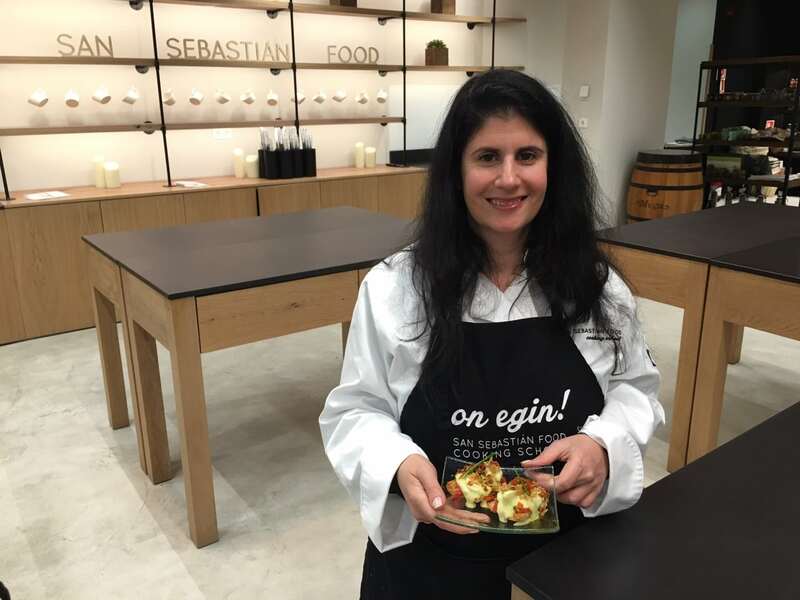 I did receive a discount on the Essential Pintxos Cooking Class from San Sebastian Food in exchange for doing an instagram takeover, they did not request that I write a post. I decided to write a post because I enjoyed my experience at the Basque cooking class in San Sebastian and wanted to share it with my readers. As always, opinions are my own. This looks so delicious! If I could cook I would try it myself. You look like you had a great time. Leanne – It was so fun! Even if you can’t cook I think you would enjoy it. You get a lot of personal attention so I’m sure the dishes would turn out well and you would probably learn alot. These looks delicious! I took a cooking class in Vietnam but never thought of taking one in Spain, even though I’ll now living in the south. I’ll have to see if I can do a tapas class! Sonja – Thanks. Yes I think a cooking class close to where you live sounds like a great idea. Let me know what you find. Everything looks delicious ! This is defo something I would love to do. Thanks Verushka! It was a lot of fun. I hope you get a chance to do one. Clare – Yes it was. What countries have you done classes in? If there are any you would recommend I am definitely interested to hear about them. That is some fancy looking food! The wine and knives are my favorite part of cooking – my husbad always laughs at me. Nicki – Haha yeah they weren’t messing around with the menu. I think the wine is my favorite part. Glad my bf is good with knives, I hate chopping stuff up. San Sebastian is on my list for the next time I visit Spain!! I also really want to try a cooking class and this looks so fun! Thanks for sharing! Christine – You are gonna love San Sebastian. I have a few other posts that will help you in your planning. What a fun experience. Love that the class went over by 2 hours. That’s a testament of how great the experience really was. It’s always fun to make what you eat. Thanks for sharing the experience! Thanks Rosemary. Yes everyone had a great time, we learned alot, had some great wine and food – what more can you ask for! Yes I really enjoyed it. Food is definitely a big part of the culture especially in Spain. Evelina – Thanks, yes it was fun, you should definitely try it some time. Drooling over here! 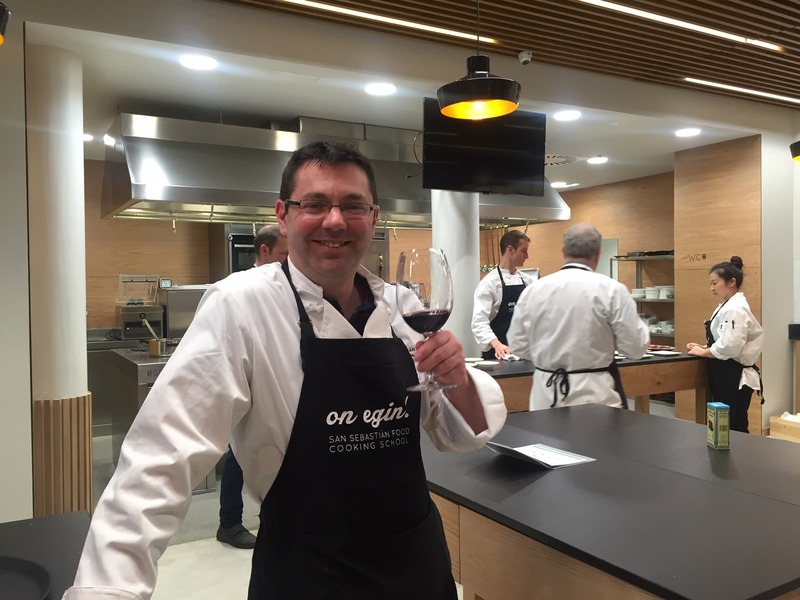 I went to my first Michelin star restaurant this summer in Valencia – 18 courses of amazing! It was well worth the money and I love that you get to sample so many different flavours. Maybe I’ll take such a class in the future! Hannah – The food was delicious. I think you would really enjoy it, so I hope you get the chance to do it one of these days! I’ve always wanted to take a cooking course! It’s nice that you were able to work on a variety of items. Cook local dishes in a new place definitely adds a new level of cultural learning. Thanks Katie. It really was a great experience! That looks superb! I would love to learn how to make the crab croquettas and also the cod sounds amazing. My next trip to Spain needs to involve cooking! Thanks Katie! Yes Spanish food is so good and it is nice to be able to make it yourself. You might enjoy the free cookbook (see expert tips). Ohhhhh my gosh this sounds and looks amazing! I’m so bad about doing cooking classes while traveling, but I know I’d love them if I did! I’m really wishing I did one in Bali. The food is amazing. Thanks Samantha! A cooking class in Bali does sound amazing. Bali is still on my list so will keep that in mind. Thanks Lisa. Yes cooking class in another country is a great experience. I hope you get the chance to do one soon. This looks like a lot of (delicious) fun. I’ve never really done a hands-on cooking class while travelling, only the rather lame ones where they show you something quick and simple. Will keep this in mind if I get a chance to return to Spain, which I’d love to. David – It was really fun. You should definitely try it when you go back to Spain. Sorry to hear about your disappointing experiences at cooking classes before! The cooking class you took in San Sebastian looked amazing. What a great experience. I have done one in Italy but I must try one there. Thanks for sharing! Thanks Stephanie! I would love to do one in Italy too. Where was the one that you did and would you recommend it? Ahhhhh I LOVE pintxos! I lived in Madrid for close to a year, and got tired of tapas really quickly. One weekend I went up to San Sebastian and the pintxos were so amazing I almost cried! Jamie – Yes! I can’t imagine getting tired of tapas! So glad you were able to visit San Sebastian and try some of the amazing food! Alex – I’m glad I’m not the only one that thought that! The food really was so good and we had agreed time. Thanks for linking up too. Ahila – Thanks. Glad you enjoyed the post! 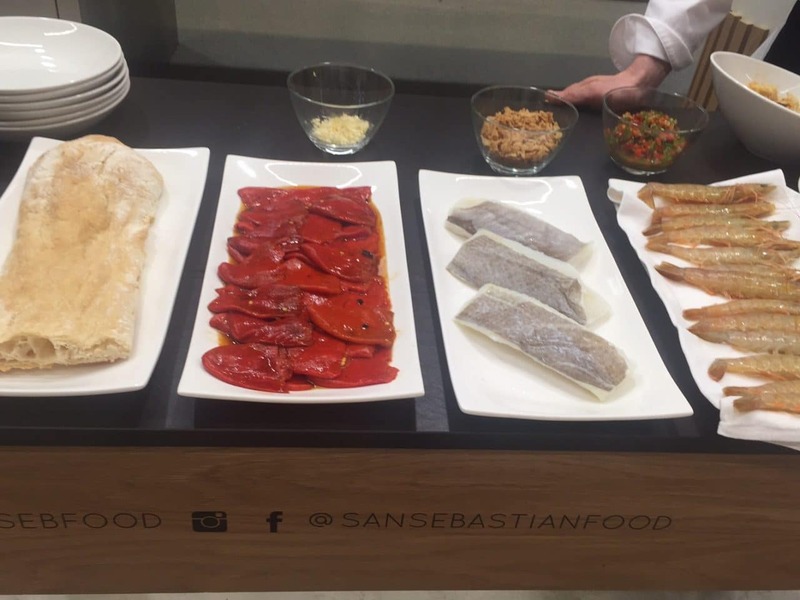 Michelle – Yes the food is one of the reasons I visited San Sebastian and it didn’t disappoint! There is a lot more to San Sebastian than just the food though (I have a few other blog posts about it). I did a cooking class in Bangkok but I liked the one I did in Chiang Mai better, but this one just blew both away. I have been meaning to try some of the recipes but haven’t gotten around to it. I can imagine it won’t be as good as when we made it in class. I hope you get to visit San Sebastian soon! Thanks for linking up! I’ll be in the Basque Region in a couple of weeks. Just the right time to read your post. Marcelle – You are gonna love it there. I have a few other posts about things in Basque Country as well that might be helpful. Also, you might want to think about visiting Rioja while you are there too. Of course, let me know if you have any questions. Clare – The food in San Sebastian is amazing and will not disappoint! We thought about doing a Pintxos tour too but didn’t have time. When we go back, I definitely want to do one. I hope you make it to San Sebastian soon! Angie – Glad you enjoyed it. Cooking classes while you are traveling are a great way to learn more about the food and the culture. And yes we had so much fun, the 6 hours just flew by! Thanks for linking up! We had a great experience in Cha am in Thailand where we were taken to a local guides Mum’s house and he gave us a cooking lesson which was brilliant. This looks like an amazing experience too, not sure about the Walnut Pudding though lol! Haha! That is really nice you got a real home cooking lesson in Thailand! Thanks for linking up with #theWeeklyPostcard! Eva – That sounds like a great goal! Have fun with it! 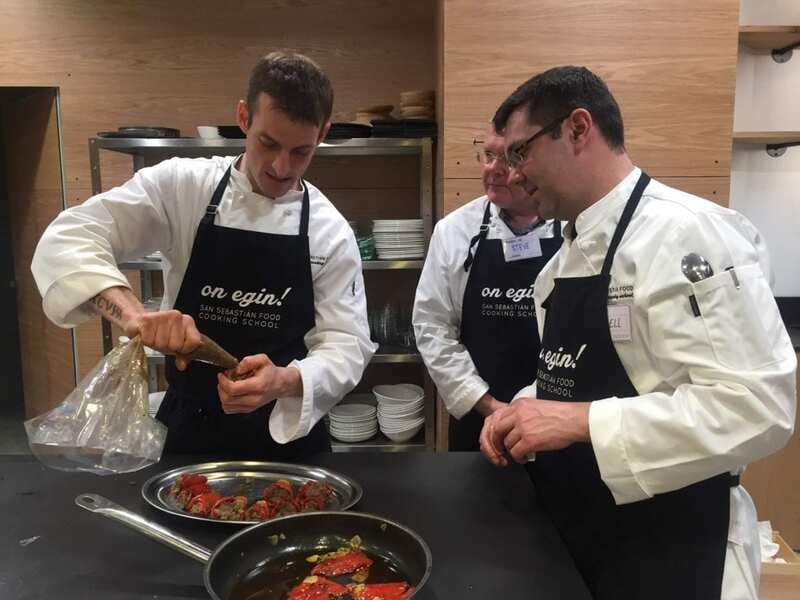 This cooking class in San Sebastian looks like so much fun. I would love to try that walnut dessert! I don’t usually choose a cooking classes when I travel, but I did recently participate in a salsa making class in Mexico and it was so much fun. I’ve never thought of visiting this area, but your post has sparked my interest! Michelle – Basque Country is really nice and I highly recommend it. I love salsa, so would definitely enjoy taking a salsa class in Mexico. Anna – Thanks so glad you liked it. The food was so good so I don’t blame you for getting hungry. I loved my time in the Basque Country! Yum, that looks really fun! Cooking classes are my fav thing to do when travelling- aside from eating 🙂 Spain is probably my fave country in Europe, the food is sooo good! Hannah – I love cooking classes too. I also did some in Thailand. Would love to do other countries too.